The low growing ground cover plant that we commonly call Pig Face are Mesembryanthemum species, the plant is more attractive than the name. 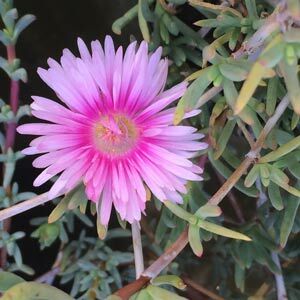 Long lasting flowers on a drought tolerant easy care plant make this a popular selection for many landscaping situations. This is a drought tolerant, easy care, low maintenance ground cover plant. It thrives in coastal conditions, sandy soils and full sun. It does not mind poor soils at a all and even copes with salty winds. Mesembryanthemum or ‘Pig Face’ plants are succulents and this adds to their tough hardy nature. The botanical name is worth a look, it actually means that the flower opens at midday. And it does, on sunny days. The flowers are colourful and daisy like, varying in colour from white through to yellows, pinks and reds. The foliage is matt forming and a good ground cover. This is a plant that is a little lax in growth habit and as such is used for trailing over retaining walls and rocks. Also very useful for growing in conatiners and hanging baskets. Position – Full sun, flowering will be restricted in shade. Flowers may also not open fully on overcast days or during rainy periods. Fertiliser – Not generally required although a little seaweed fertiliser can be beneficial. Pruning – Cut back to maintain a more tidy clump. Poor air circulation and excess humidity can cause fungal problems. Mealy bugs can be a problem.